Blackberry yang langsung dari luar sepertinya masih belum ada bahasa Indonesia, nah untuk menambah bahasa Indonesia ke Blackberry bisa dilakukan sendiri kalau ga mau repot ya minta diinstalkan saja biayanya paling 50 ribu. 2. install sofware BlackBerry Master Control Program. 3. jalankan software BlackBerry Master Control Program. 4. Lakukan konfigurasi di BB apakah akan menambah bahasa indonesia dst..lakukan dengan sabar, jangan tergesa-gesa karena BB nampaknya tidak bisa jalan kenceng.loadingnya saja kayak komputer. Have you ever wanted to try Ubuntu but didn’t have a spare computer to run it on? This tutorial will show you how a virtual machine like VirtualBox will let you play with other operating systems without having to change what’s on your computer right now. 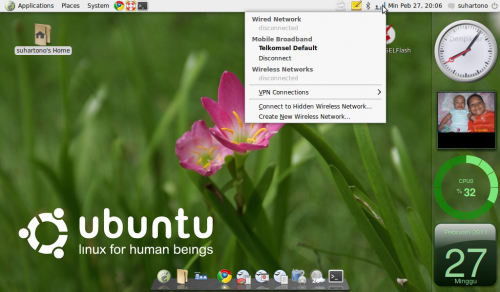 It will guide you through an installation of Ubuntu Linux into VirtualBox. The tutorial will first cover how to install VirtualBox and set up your first virtual machine. Then it will show you how to get Ubuntu and prepare for installation. Finally, the tutorial will walk you through an installation of Ubuntu. Select a download location near you from the drop-down box. Click the “Begin Download” button to start downloading Ubuntu. Download the latest version of VirtualBox. Download the latest version of VirtualBox. You can get it from http://www.virtualbox.org/wiki/Downloads. There are versions available for Windows, Mac, and Linux. If you’re not sure what operating system you’re running, download the Windows version at the top by clicking “x86/amd64”. Start the installation and click “Next” to reach the license agreement. Choose the “I accept” option and click “Next” to continue. Choose not to install USB support, networking, or Python support by clicking the grey icon near each option and selecting the red X or “Entire feature will be unavailable”. Choose not to install USB support, networking, or Python support by clicking the grey icon near each option and selecting the red X or “Entire feature will be unavailable”. Then click “Next” to continue. If this is your first time dealing with virtual machines, this will eliminate the need to install custom drivers, which makes installing and uninstalling VirtualBox easier. 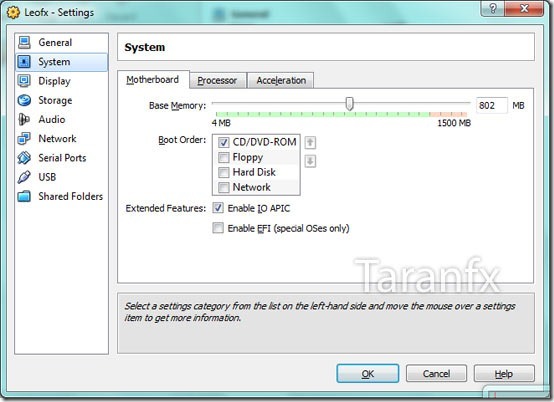 If you’ve worked with virtual machines before, you can choose to keep these options selected. Deselect the Quick Launch Bar checkbox and click “Next” to continue. Click “Install” to install VirtualBox. Click “Finish” to open VirtualBox. Select your new virtual machine. Select your new virtual machine. Then click the “Settings” button. Click the checkbox near “Mount CD/DVD-ROM”. Click the radio button near “ISO Image”. Click the folder icon near the active drop-down box to open the Virtual Media Manager. In the Virtual Media Manger, click “Add”. Locate the ISO image of Ubuntu and select it. Locate the ISO image of Ubuntu and select it. Then click “Open”. Click “Select” to use the image in your virtual machine. In VirtualBox, click the “New” button to start the virtual machine wizard. Give your virtual machine a name and select the operating system you’ll be running, then click “Next”. Give your virtual machine a name and select the operating system you’ll be running, then click “Next”. For this example, we’ll be installing Ubuntu. Type any name in the Name field (such as Ubuntu or Linux). For “Operating System”, choose “Linux”. The version will automatically default to “Ubuntu”. Click “Next” when you’re done. Select the amount of memory your VM will use and click “Next”. Select the amount of memory your VM will use and click “Next”. When you chose your operating system in the previous step, VirtualBox automatically recommends the proper amount of memory to use. If you feel this amount isn’t correct, you can move the slider or type a new amount in the box. Click “Next” when you’re done. Click “Next” to create a new virtual hard disk; then click “Next” again. Click “Next” to create a new virtual hard disk; then click “Next” again. This opens a second wizard to create a new virtual hard disk. Select either “Fixed-Size Storage” or “Dynamically Expanding Storage” depending upon your needs. Select either “Fixed-Size Storage” or “Dynamically Expanding Storage” depending upon your needs. A fixed size storage is going to be the size of the virtual hard disk on the host OS (e.g. : a virtual disk 8 GB will be 8 GB on the host OS’s hard disk). A dynamically expanding will be only the size of Ubuntu on your hard disk, but will grow in size as files are added to it until it reaches its limit (e.g. : Virtual disk is created and has a 1 megabyte file on it. The size of the virtual disk is 1 megabyte. Then, another 1 megabyte file is added. The size of the virtual disk is 2 megabytes. This goes on until it reaches the specified size of the disk). Click “Next” to accept the default name and size of the virtual hard disk. Click “Next” to accept the default name and size of the virtual hard disk. Again, VirtualBox recommends the proper size of your virtual hard disk. If you feel this amount isn’t correct, you can move the slider or type a new amount in the box. Click “Next” when you’re done. Click “Finish” and wait while VirtualBox creates the new virtual hard disk. Click “Finish” once more to create your new virtual machine. Select your virtual machine. Then click the “Start” button. A dialog box will pop up informing you about “Auto capture keyboard”. A dialog box will pop up informing you about “Auto capture keyboard”. Check the checkbox and click “OK” to proceed. Another dialog box will pop up informing you about 32 bit color mode. Another dialog box will pop up informing you about 32 bit color mode. Again, check the checkbox and click “OK” to proceed. Hit the Enter key on the language selection screen to select English. Hit the Enter key again to start Ubuntu. Once Ubuntu has loaded, click once inside the VirtualBox window. Once Ubuntu has loaded, click once inside the VirtualBox window. A dialog box will pop up informing you about mouse capture. Check the checkbox and click “OK” to proceed. Move your mouse to the “Install” icon and double-click to start installation. Click “Forward” to select your language. Select your time zone from the drop-down menu, then click “Forward”. Click “Forward” to keep the default keyboard layout. Click “Forward” again to select the default partitions. Type your name in the first text box. Type your name in the first text box. This will automatically fill in the login name and computer name. You can customize these names by typing a new name inside the corresponding text boxes. Choose a password and type it in twice. Scroll down the page and select the radio button beside “Log in automatically”, then click “Forward”. Scroll down the page and select the radio button beside “Log in automatically”, then click “Forward”. If your password is weak, the installer will point it out. Simply click “Continue” to ignore the warning. Once installation is complete, click “Restart Now” to finish installation. When you see the white text on the shutdown screen, hit the Enter key to finish. If you did not install the USB driver, every time you look at the settings for a virtual machine, you’ll get a warning saying VirtualBox failed to access the USB subsystem. This is normal and will not affect your virtual machine. Just click “OK” to move on. When you give focus to your virtual machine, VirtualBox automatically connects your keyboard to the virtual machine. To release your keyboard, simply hit the Right Ctrl key. When you click inside a virtual machine, VirtualBox automatically connects your mouse to the virtual machine. To release your mouse, simply hit the Right Ctrl key. Ada beberapa hal yang harus di perhatikan sebelum mengikuti tutorial ini, installer yang kami pakai disini adalah installer resmi Mac OS X 10.6 Snow Leopard. Jika Anda bertanya di mana mencarinya, silakan cari sendiri di Internet atau bisa beli di toko yang khusus menjual produk Apple. 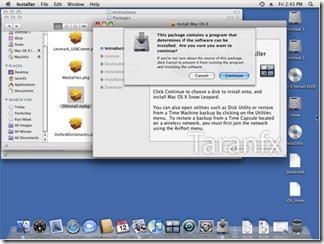 Menurut beberapa sumber yang penulis dapatkan, installer Mac OS X 10.6.3 snow Leopard versi retail bisa Anda dapatkan dengan harga US$39. Cukup murah apabila dibandingkan dengan versi Windows 7 yang paling standar, yaitu Windows 7 Starter yang harganya US$53 di situs yang sama. OS: Windows 7 Ultimate 64-bit (jika anda mempunyai 32 bit, saya rasa tidak ada masalah, tetapi disini saya mencoba dengan 64-bit). Sesudah Anda memilikinya,langkah pertama yang harus dilakukan adalah membuat image ISO-nya. Untuk keperluan ini,kita membutuhkan aplikasi freeware bernama ImgBurn yang bisa di-download gratis dari www.imgburn.com dengan file berukuran 5, 09 MB. 1.Jalankan,dan instal ImgBurn seperti biasa. 2.Setelah selesai,pilihan Create image file from disc. 3.Pilihan drive dan lokasi hasil penyimpanannya , klik Read. 4.Proses pembuatan image ISO akan dijalankan. 5.setelah selesai,ukuran image ISO yang kami hasilkan sekitar 7,23 GB. Sedikit info, saat membuat ISO ini,sebisa mungkin gunakan DVD writer, jangan DVD-ROM biasa. Karena dari beberapa percobaan yang penulis lakukan, saat membuat ISO dengan menggunakan DVD-ROOM,cenderung menghasilkan error. Secara default,installer Mac OS X tidak bisa dikenali oleh Windows karena menggunakan file system HFS. Jika Anda mencoba untuk memasukan DVD installer itu ke dalam drive,maka yang terlihat seperti ini,atau bahkan terlihat seprti disc kosong yang tidak ada isinya. Saat dilihat di Properties-nya pun, kapasitasnya akan terlihat hanya sekitar hampir 1GB. Padahal installer tersebut memiliki kapasitas 6GB lebih. Lalu bagaimana caranya agar installer itu bisa dibaca dengan benar oleh Windows?. Kita akan menggunakan sebuah aplikasi bernama MacDrive yang bisa di-download dari http:// download mediafour.com/macdrive/dengan ukuran file 5,87MB Aplikasi ini bukanlah freeware, dan untuk keperluan kali ini Anda harus menggunakan yang full version, bukan versi trial-nya. Bagaimana cara mendapatkan yang full version? Silakan cari sendiri informasinya di Internet. Download dan Install MacDrive seperti biasa. Setelah diregistrasi dan menjadi full version, jalankan MacDrive, dan klik Change MacDrive Options. Pilih tab Settings, dan hilangkan centang pada Remind me about MacDrive Updates, dan pilih Show Mac files. Sekarang coba Restart PC atau laptop anda setelah itu, maka drive DVD anda sudah bisa mengenali Installer Mac OS X tersebut. Indikatornya adalah di icon drive DVD yang ada di windows Explorer, akan ada tambahan logo apel berwarna merah, dan sewaktu dibuka file mac akan dikenali sebagai file system HFS+. Penggunaan MacDrive ini bersifat opsional. 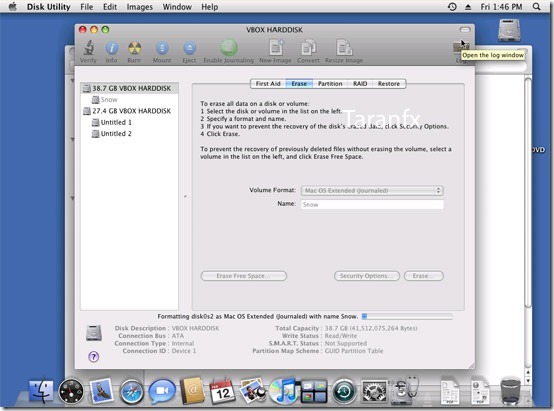 Dalam proses instalasi dengan Virtualbox nanti ataupun proses instalasi Mac OS X nya sendiri, tidak membutuhkan MacDrive.Aplikasi ini di butuhkan bila anda ingin membuka media penyimpanan yang menggunakan file system HFS atau HFS+. Installer sudah siap dan hardware sudah mendukung, sekarang saatnya proses installasi. Kita akan membutuhkan beberapa aplikasi. Yang pertama tentu saja VirtualBox yang bisa di download gratis dari situs resminya yang beralamat di http://www.virtualbox.org/wiki/Downloads . Yang dibutuhkan selanjutnya adalah bootloader. 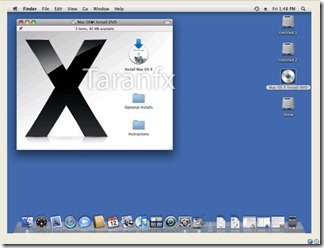 Boot Loader ini bertindak sebagai pancingan agar Mac OS X mau di install dan di jalankan di dalam VirtualBox. Jika processor anda Intel, gunakan boot loader yang ada di http://mediafire.com/?thd5nmo2oyn. Sedangkan jika processor anda AMD, download di www.mediafire.com/?m5wzzwyfg4m secara gratis. Seandainya anda menemukan jendela peringatan seperti gambar di bawah ini, selalu pilih Install. Setelah VirtualBox selesai di install, jalankan dan klik NEW. Beri nama sesuka anda, dan di OS Type pilih MAC OS X dan MAC OS X server. Selanjutnya aturlah berapa besar RAM yang akan di berikan oleh Mac Os X, minimal 1 GB. Semakin besar semakin baik, tapi tergantung dari jumlah RAM yang anda miliki. Karena saya memiliki RAM 2GB jadi 1GB saja sepertinya sudah cukup. Berikutnya pilih Opsi Create New Hard Disk. Klik Next dan selanjutnya pilih Opsi Dynamically expanding storage. Tentukan lokasi harddisk virtual dan tentukan pula kapasitas yang akan digunakan, 20GB sudah cukup. Klik finish untuk mengakhiri setting awal VirtualBox. Kembali ke jendela utama virtualbox, klik Settings. Pilih System, di tab motherbard, hapus tanda centang pada Floppy, dan Boot Ordernya menjadi CD/DVD ROOM, kemudian Harddisk. Hapus juga tanda centang pada Enable EFI dan Hardware Clock. Masih di System pada tab Processor dan Acceleration, beri tanda centang pada opsi Enable PAE/NX, dan Enable VT-x/AMD-v, serta Enable Nested Paging. Pindah ke display, maksimalkan video memory, dan beri tanda centang pada Enable 3D Acceleration. Pindah ke Storage, klik IDE Controller, dan pastikan tipe yang di gunakan adalah ICH6. Lalu, klik item bernama Empty. Klik Add, dan arahkan ke file boot loader yan sudah kita ekstrak sebelumnya. Untuk processor AMD arahkan ke file Empire-EFI4AMD.iso. dan untuk Intel arahkan ke file empireEFIv1085.iso. Kembali ke jendela sebelumnya, pilih file boot loader yang baru kita add, dan klik select. Di jendela utama VirtualBox, klik Start. Biarkan boot-loadernya berjalan sampai muncul layar dengan gambar EMPIRE EFI. Sekarang klik kanan icon IDE Controller yang ada di bagian bawah virtualbox, dan pilih Chose CD/DVD images. Akan terbuka kembali jendela Virtual Media Manager. Sekarang , arahkan ke file ISO installer MAC OS X yang tadi sudah kita buat. Caranya sama seperti meng-add boot loader tadi. Tekan F5, lalu Enter. Proses installasi akan mulai dijalankan. Masuk ke GUI Mac OS X, pilih USE English for the main leangue. Berikutnya, klik menu Utilities > Disk Utility. Pilih VBOX HARDDISK, klik Partition. Pada volume Scheme ilih 1 Partition, atau 2 Partition sesuai dengan kebutuhan. Beri nama, lalu pilih format MAC OS Ex-tended (Journaled). Klik Apply. Di jendela yang muncul, pilih Partition. Setelah partisi selesai, tutup Disk Utility. Kembali ke installasi, pilih harddisk/ yang ingin di pakai. Klik Install. Sekarang anda bisa duduk dengan tenang sambil menunggu proses installasi berlangsung. Di bagian installasi terakhir akan di beritahukan bahwa proses installasi gagal. Jangan khawatir! Masukkan kembli boot loader melalui Virtual Media Manager. Di menu VirtualBox, pilih Machine, Reset. Jendela loader bergambar EFI EMPIRE akan muncul, sekarang pilih nama instalasi anda. Lalu Enter. Begitu masuk, anda akan disajikan wizard yang saya rasa anda sudah bisa mengisinya sendiri. 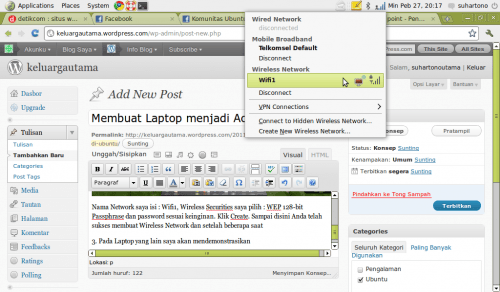 Kini anda bisa menikmati Mac OS X Snow Leopard di dalam Windows 7. Selamat mencoba! Hardware anda harus sudah mendukung tekhnologi Virtualization. Jika belum, anda bisa membuat pilihan menjadi ENABLE, pengaturan Virtualization terletak di BIOS. Saat ingin memulai MAC OS X, pastikan boot loader sudah dalam posisi aktif, sebab bila tidak, maka MAC OS X akan tidak bisa loading. Last time when I wrote the How to Install Snow Leopard on VMWare guide, I had users who were seeking Virtualboxversion, and I had it promised. After 2 months of experiments, fighting in the dark, and with help from black Trinitron, the work is done and I think its time to reveal it. Who doesn’t love Open Source? And when a Open source product is better than a paid application, we adore it. So is the case with Virtualbox. Virtualbox 3.1 is an amazing platform for Virtualization, It’s not only free, but also much faster than VMware in Disk I/O, Network I/O, RAM optimization, CPU Usage, Hypervisor level operations. Hats off to Sun–Oracle. Note: This is a Retail installation guide, hence little more tricky. If you don’t mind an osx86 distro inside virtualbox and want ease of installation, tryout Install Mac OS X Hackintosh in VirtualBox [Snow Leopard] instead. Before you begin, make sure you have enough CPU, RAM, Disk resources to share for the virtual machine. Processor: Any Intel Processor with VT-x (Virtualization Technology) or AMD-V. (Almost all Intel processors starting from Core 2 Duo, Quad, etc. support it) Ask us, if you still have a doubt: @geeknizer. Snow Leopard Retail Disc (or ISO). We recommend you buy Original, don’t pirate! Brief: We will be installing Osx86 Leopard then upgrading to Snow Leopard Retail, that is 100% upgradeable to 10.6.2 and Works on Windows XP, Windows Vista, Windows 7. Alternatively, You can install Snow Leopard directly via an OSx86 Distro like SnowOSX (but that won’t be upgradeable, unless you use SnowOSX v3.6 which is already 10.6.2. But the upcoming 10.6.3 update won’t be possible). So let’s go the usual way (Leopard then Snow Leopard Retail), though it’s upto you to choose. Step 2. Open Virtual machine xml. Step 3. Switch on Virtual Machine and install Leopard distro as-usual. (You can check Install Leopard on PC guide, if you are new to OSx86). Alright, Leopard setup would succeed and is up and running after reboot. (Make sure you change boot priority to “Leo” Hard disk in VM settings). Stuck somewhere? Get in touch @geeknizer on Twitter. Update: I heard Virtualbox 3.1.4 Beta works out of the box, without patching. I haven’t tried that though. Attach A new Disk (10 GB minimum) with name “Snow”. DVD drive, if you plan to use Snow Leopard Retail disk OR The Retail image. (use PowerISO to convert DMG to ISO). Download and attach this Addon Util image[iso]. (contains few Kexts, utils). Step 5. Select “Snow” disk and customize install to remove unnecessary packages (languages, printers) and Install. Installation should finish without any problems. Nice! Hold down your patience we are almost done. Step 2. Run the Virtual Machine and you will land into desktop with everything (including internet) working. Note: If your mouse doesn’t work use this Kext. For me it worked as-is. Go ahead and update to 10.6.2. And when the upcoming 10.6.3 is released, you will be able to upgrade without issues. Hotspot area kini telah menjamur dan menjadi populer di kalangan netter – netter Indonesia. Bagi anda pemilik laptop pasti sudah pernah mencoba berinternet dengan menggunakan hotspot di berbagai hotspot area. Menggunakan hotspot memang relatif mudah dan murah..bahkan tidak jarang kini banyak area hotspot yang bisa kita nikmati secara gratis. Namun sayangnya, pada kondisi – kondisi tertentu, kita tidak bisa menikmati suasana hotspot tersebut. Misalkan saja saat berada di rumah teman yang menggunakan koneksi ADSL / kabel, di hotel yang menggunakan ethernet connection dsb. Namun jangan khawatir, bagi anda yang memiliki laptop dengan sistem operasi windows 7, anda bisa membangun jaringan hotspot hanya bermodalkan koneksi internet dan laptop anda. 3. 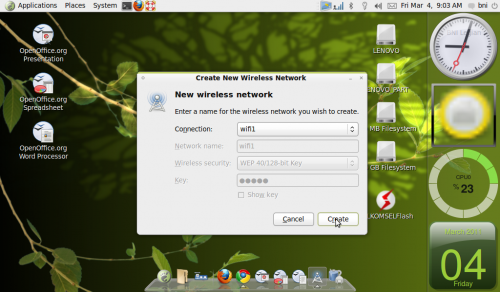 Isikan nama WiFi network, password access, kemudian tentukan jenis koneksi yang ingin anda gunakan untuk berbagi (support LAN, VirtualBox Host Only, Wireless Network, serta tanpa internet sharing). Setelah itu klik start hotspot. 4. Setelah itu program tersebut akan bekerja dan silahkan mengkoneksikan komputer / laptop lainnya ke laptop anda. 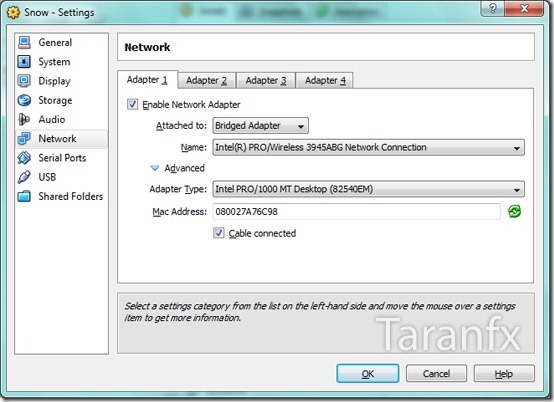 4. laptop yang bersistem operasi windows XP sudah terkoneksi ke jaringan hotspot yang dibuat oleh laptop windows 7 dengan connectify. semua laptop teman – teman anda bisa terkoneksi dan anda bisa mulai berinternet bersama teman – teman hanya dari 1 koneksi internet kabel saja , mudah sekali bukan?? Dengan banyaknya pilihan operator yang tersedia saat ini, semakin mempermudah setiap orang untuk dapat koneksi internet murah. Nah, terkadang ada pemikiran bagaimana menjadi lebih murah dan efektif untuk memanfaatkan 1 USB Modem yang dimiliki sehingga dapat dipakai sebagai koneksi internet yang dapat dibagi pakai (sharing). Atau kalau bahasa internetnya adalah menjadikan Laptop yang memiliki USB Modem difungsikan sebagai Access Point / Hotspot. Bagaimana caranya ? 4. Akan muncul kotak dialog : Wireless Securities dan Password Key, agar dipilih dan diisikan seperti data di atas, kemudian klik Connect … Nah Laptop sudah connect ke Internet melalui Wifi1 dan silakan berselancar. DHCP server ato Dynamic Host Configuration Protocol, merupakan salah satu protocol yang bermanfaat untuk melakukan menagement IP address. Dengan menggunakan aplikasi ini, admin dapat melakukan menajemen IP terhadap suatu network. selain itu, admin jaringan juga bisa menetukan ip address untuk masing-masing host, sehingga tidak ditemukan lagi ip address – ip address liar yang kadang membuat pusing administrator jaringan. 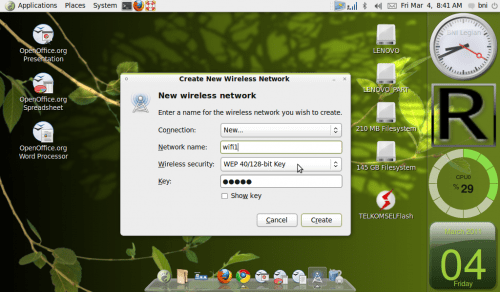 Untuk Server DHCP ini , ini meletakannya di gateway pc router, karena saya pikir untuk meletakannya dalam 1 server terpisah, kok sepertinya mubazir, hehhehe untuk konfigurasi DHCP ini, saya menggunakan Linux sebagai OS nya, distronya Suse 10.2.
kalau file diatas belum ada, gunakan fasilitas yast untuk mengintal software di atas.